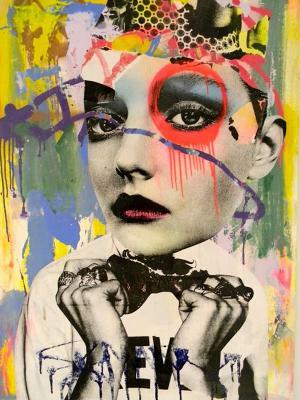 the intersection of graffiti and hollywood glam is where brooklyn-based artist dain creates his artworks. 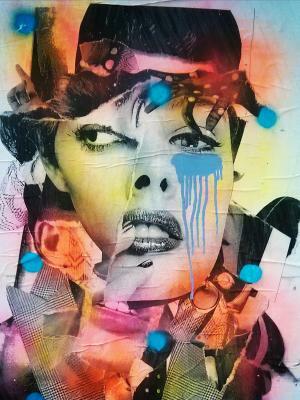 that wheat-paste on the wall of the hollywood actress radiating a myriad of colours and collaged newsprint, well that be the work of dain. from audrey hepburn to keira knightley, they’re all peering from the wall with a coloured circle surrounding one eye. 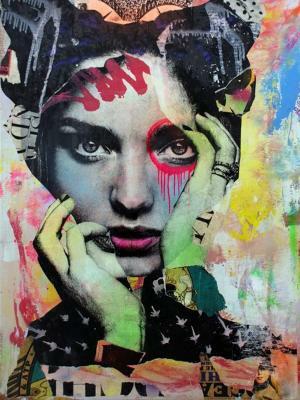 in recent years, dain has moved from the streets and into the gallery. welcome to powder dain, it’s such a pleasure to have an artist such as you to speak with. With your crossing of glamour and grit you’ve been a powder favourite for some time now. well dain, firstly, what do you think your pieces say to the passerby on the street? Not sure, I think you need to ask them. I do hope they smile when they stumble upon my work. what’s with the glamorous hollywood actresses? how’d they become your muses and who is your favourite? Beauty + simplicity... Sophia Loren is one of my favorites. 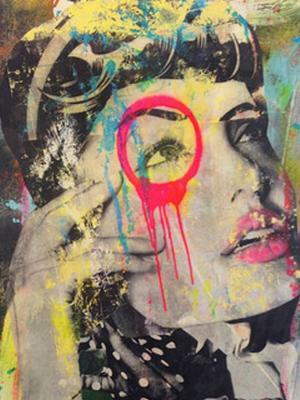 what’s the process you undertake when you’re making a collaged wheat-paste? Good eyes, bold images, and proper balance. what’s it like working on the streets of new york city? what are the delights and the hassles? It’s cool... not quite the same, they cleaned up many neighbourhoods (street art). There are still many old doorways that are good to hit. I hate rats, they are everywhere in NYC - they're my biggest hassle. have you ever been in trouble with the law when you’ve been creating on the street? what lead you down the alleyway to becoming a street artist? I've been doing graffiti for years… Most people read a few books and think that the only graff artists were the ones who hit the subways. Not true. There were guys that bombed the highways, garbage trucks, rooftops etc... guys you will have never heard or read of. recently, you’ve made the move from the streets and into the gallery. how’s that been and where have you been exhibiting? and what projects are you working on now and what have you got coming up? I love showing at galleries, especially ones that don't really showcase "street" art. I'm working on some new canvas pieces for Miami next month. I have a lot of work at Avant Gallery in Miami- great gallery. and what’s hot in new york city right now on the street? 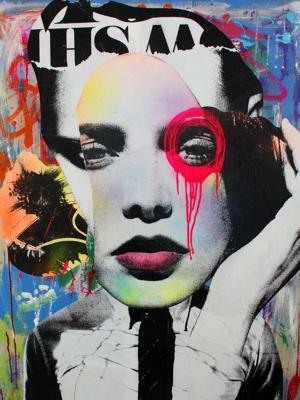 dain your art is so chic and seductive and oh we look forward to seeing your next pieces. thank you so much for speaking with us here at powder.